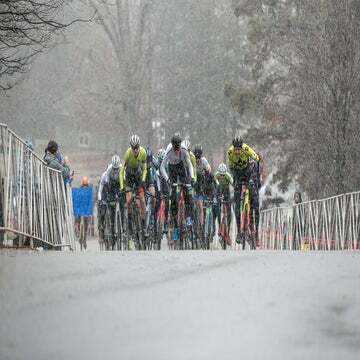 After a one-year absence from the USA Cycling Professional Cyclocross Calendar (ProCX), the Nittany Lion Cross returned Saturday. Erica Zaveta (Garneau-Easton Cycling), currently sixth in the ProCX women’s standings, took her first win this season for the elite women. Men’s ProCX points leader Kerry Werner (Kona-Maxxis-Shimano) won the elite men’s race, continuing his streak. Erica Zaveta took a narrow win over Laura Van Gilder (Mello Mushroom/Van Dessel). Arley Kemmerer (Fearless Femme Racing), winner of the 2016 Nittany Lion race, took the early lead on the first of six laps and was joined at the front by Regina Legge (Green Line Velo-Zipcar) and Erica Zaveta after a few more circuits. With three laps to go, the early leaders were joined by Emily Shields Werner (Amy D. Foundation), Rachel Rubino (Fearless Femme Racing), and Van Gilder. With two-and-a-half laps to go, the field had fractured, leaving three out front to battle for the podium: Zaveta, Van Gilder, and Kemmerer. Van Gilder and Kemmerer launched attacks, but it was Zaveta that made the telling move. Zaveta, who had two fifth-place finishes at Rochester Cyclocross last weekend, took the win in a time of 49:41. Just four seconds back was Van Gilder for second, and Kemmerer would take third. Kerry Werner took a narrow win on home turf over Matthieu Boulo (Team Pays de Dinan) in the men’s race. 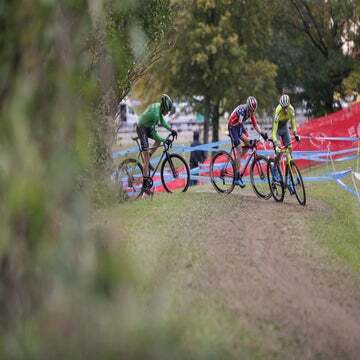 Curtis White (Cannondale-Cyclocrossworld) went out to an early lead, and Werner joined soon after. Boulo closed the gap to the two leaders on the second lap. On lap five, three laps later, Werner attacked off the front but failed to gain a significant gap over Boulo. In the final three laps, Buolo gained the lead when Werner slid out on a muddy off-camber section. The final attack from Werner was on the bell lap, giving him the win in 58:07, 21 seconds over Boulo. Meanwhile, White lost time on the two leaders with four laps to go but retained his position. He finished third, 1:48 back.